March is here, and that means that Spring is right around the corner. The greenhouse is already toasty warm and filling up with green plants. We're savoring these first moments of warmth and growing things! In July we'll look back and wonder where the time went. And now for the news you've been waiting for! The CSA Store is open and ready to accept your membership for the 2014 season. Prices are posted on our website (here), along with updated FAQs. All members that register and whose first payments are received by April 1st, will get an early sign up bonus.This year the bonus is your choice of a six pack of annuals. Any six pack we grow - so you can choose flowers, vegetables or herbs! Paying online with your credit card is the easiest way to make sure your payment is received by April 1st (a little more reliable then the mail) but if you would like to send a check, please mail it early enough to be sure we receive it in time. Regular registration deadline is May 1st. Hello from the farm! The persistent rain this Spring is a continuing challenge. It slowed things down and delayed the harvest on Spring crops like peas, lettuce, and beets. And then, it shortened the strawberry crop! I don't mind waiting for peas, but I am disappointed that strawberries are already done here. We've said good bye to Spring crops of Rhubarb, Strawberries, and Spinach - it's time to embrace Summer! To help you keep up with the changing seasons, here's a loose prediction of what the next month or so will look like. : Right now we're in our third planting with one more to go. We should have peas for two more weeks (mid-July)! Lettuce: Our fresh lettuce will be available until mid-July. Zucchini and Summer Squash are here now and will be until at least the end of July. Sour Cherries showed up at the end of June. There isn't a lot of the first variety, so they won't be around too long. Later varieties will be here in mid July, and should last about 2 weeks. Sweet Cherries arrived on June 28th, and they'll be around just into the beginning of August. Fresh broccoli crowns, available by the pound. : our broccoli plantings are shaping up to be pretty epic this year, with a total of about 400,000 broccoli plants in the field. We're in the first harvest right now! will start showing up in about two weeks. We're doing a planting each week for the entire month of July, with the last one going in on August 1st. This means we should have a steady supply for all of August and well into September, if Mother Nature cooperates. 3,000 feet of Beets were planted two weeks ago. We're looking forward to having lots to pick in about six weeks! In our next update, we'll have news on tomatoes, peppers, sweet corn, and peaches. Dark Sweet Cherries showed up last Saturday. Freeze them, dry them, blend them with lemonade, toss some onto a salad - if they make it home that is! 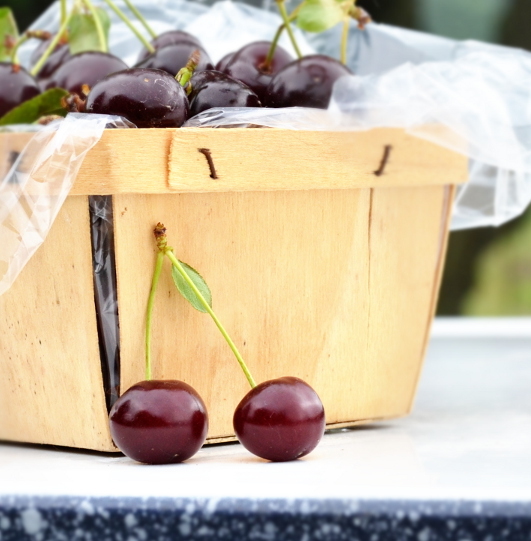 When the Sweet Cherries show up, Sour Cherries can't be far behind. We've had strawberries for several weeks but they won't be here much longer. Now is the time to purchase by the flat for jam, juice, and freezing. Freezing is my favorite way to preserve strawberries for the winter. Last year I somehow ran out of time and only got around to making jam. Let me tell you, I missed them alll winter. And I learned my lesson - there are eight quarts in my freezer right now! so we can take a short walk out back and pick more whenever we need to. We keep at least two heads of each type available (Green Leaf, Red Leaf, Ithaca, and Buttercrunch), and you know it's fresh! I didn't know what good lettuce was until we started growing it ourselves. It is so sweet and tender and beautiful! Regular Peas are still going strong! We'll have them for a few more weeks, so take a few pounds home to enjoy a little pea-shelling meditation on the front porch. Almost everything is early this year so we have to keep you informed! That warm weather early this Spring gave everything a little bit of a head start. Cherries: in the market since 6/20, we'll have sweet cherries for several weeks yet. Sour cherries will be here before July, we hope. A little later and with a shorter season then sweet, you definitely want to catch some before they're gone. We like to eat them fresh, make some into a cobbler and of course... cherry pie! Strawberries: I picked a few quarts this afternoon and there are plenty of big beautiful berries out there. If you're not interested in picking your own, we have plenty in the market already picked. Lettuce: fresh Kirbygrown lettuce is so tender and crisp. (I have been tempted to eat an entire head for lunch on more then one occasion, dressed simply in a cider vinagrette). Red leaf, green leaf and buttercruch! Peas: Sweet and Edible Pod are here at the moment. Our second planting is just getting started. Coming soon: zucchini, summer squash, early peaches. As always, call ahead if you're coming for a specific item! You never know when we might sell out of something and we don't want anyone to be disappointed. Feel free to place an order by phone or in person ahead of time and if it's in the field we'll have it ready to go at any time, on any day.